Fresh Strawberry Cupcakes made from scratch! 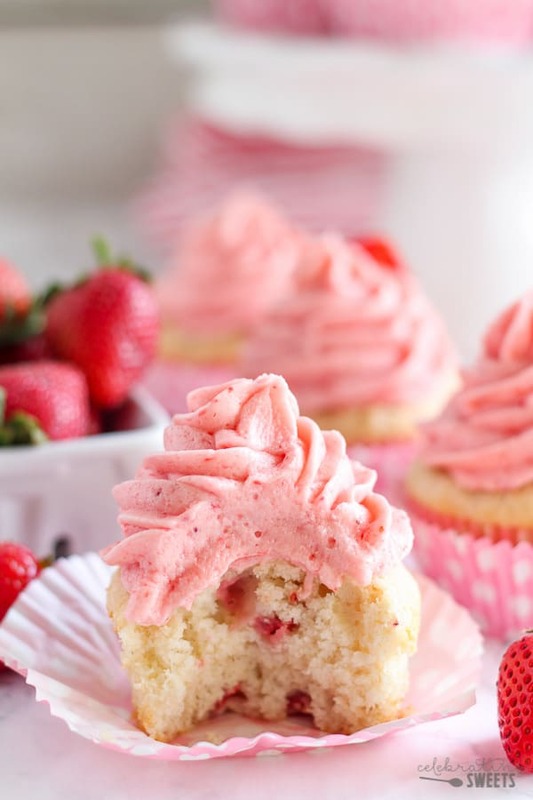 Moist and tender vanilla cupcakes filled with fresh strawberries and topped with strawberry buttercream. No artificial colors or flavors – pure, fresh strawberries in every bite. VIDEO below. You know that summer is here (or almost here) when most of my recipes have berries in them. Five of my last six recipes featured berries (sorry/not sorry?). I love baking with fresh berries this time of year! 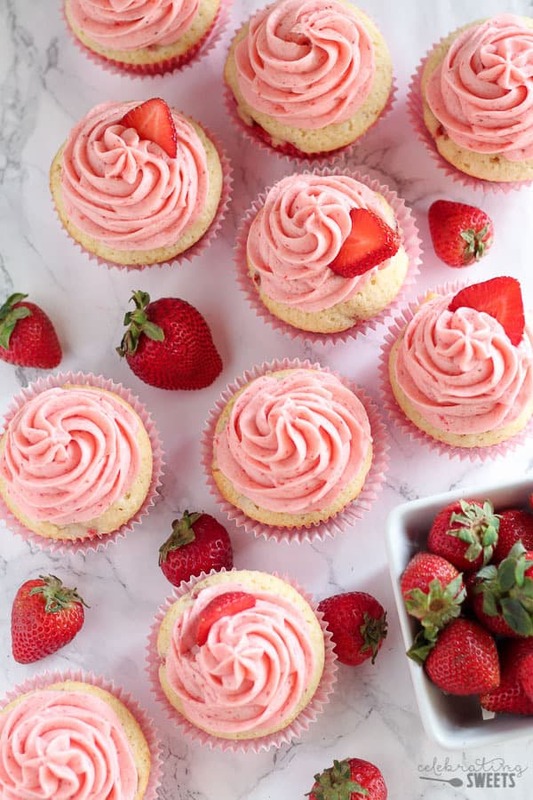 These cupcakes are worlds away from a typical boxed strawberry cake mix. I love that the pretty shade of pink comes from fresh strawberries, not food coloring. They are moist and tender and filled with real ingredients. The cake itself is flavored with vanilla extract and small pieces of fresh strawberries. The cupcakes are fluffy and buttery, and you can’t beat those diced strawberries running all throughout. Tip: Use the best strawberries you can find. The more red and sweet and they are, the better! If your strawberries are slightly under ripe, or not very sweet, you might want to hull them, to make sure those flavorless white pieces don’t make their way into the cake or frosting. Let’s talk frosting! 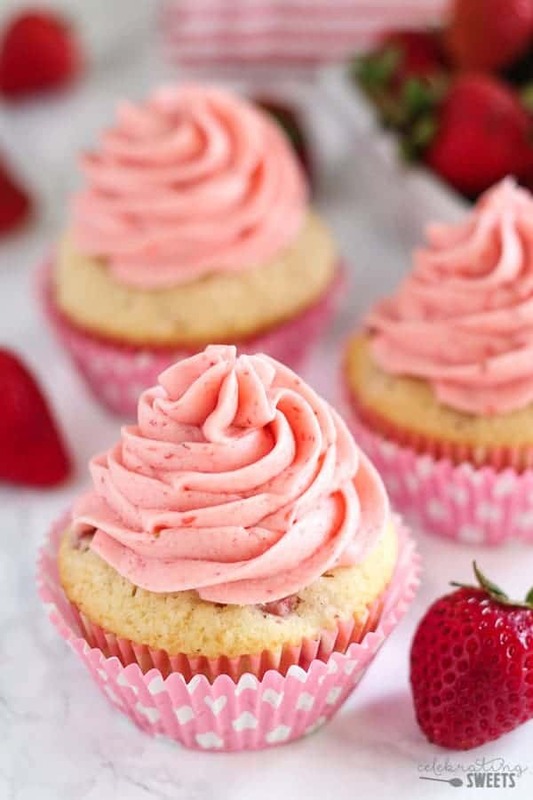 These Strawberry Cupcakes are topped with the prettiest Strawberry Buttercream Frosting. The frosting is made with pureed strawberries and strawberry jam. 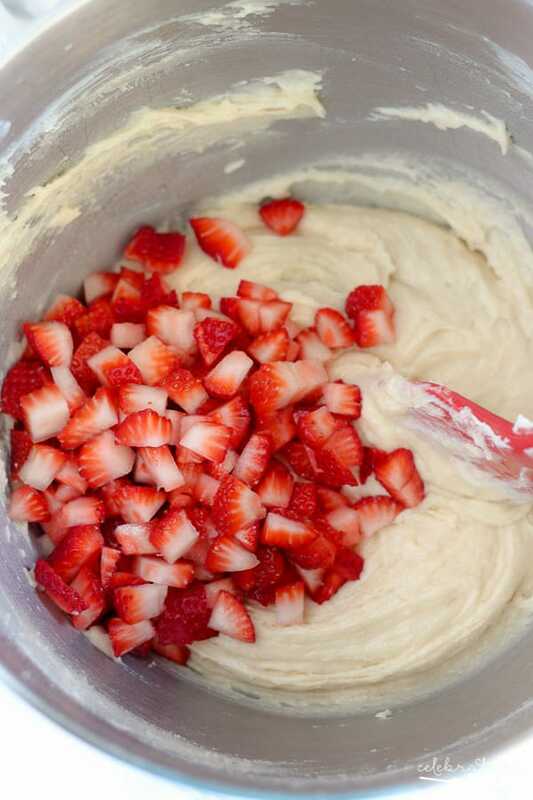 The color of your frosting is going to vary depending on the how dark your strawberries are. I’ve made these nearly a dozen times, and the frosting can range from a lighter pink to a darker pink. It’s beautiful and delicious no matter what shade it is! And it’s the absolute perfect compliment to our strawberry cupcakes. I take a lot of pride from the fact that these cupcakes are made from scratch and with real strawberries! Most cake mixes and frostings are loaded with fake strawberry flavoring and food coloring. There is no need for that fake stuff, when you have beautiful sweet strawberries to be the star of the recipe. 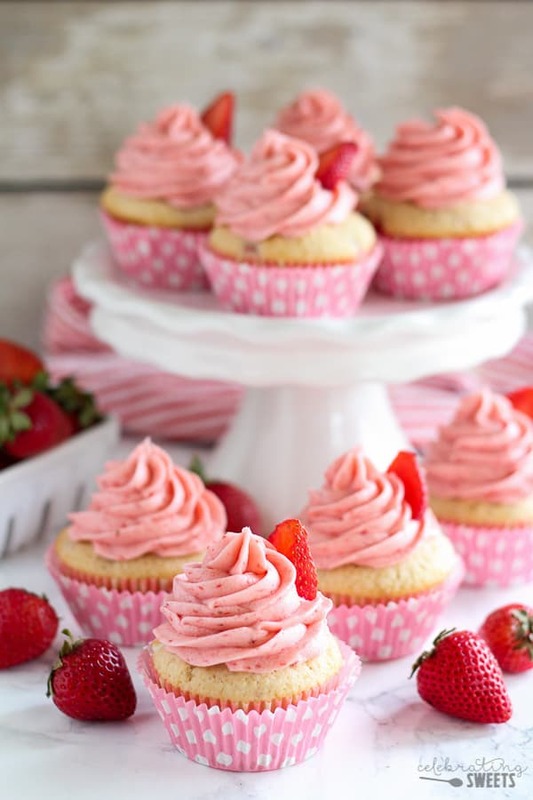 And it’s not just me that loves these Strawberry Cupcakes. My readers love them, my friends and family love them – this really is one of the best cupcake recipes ever. 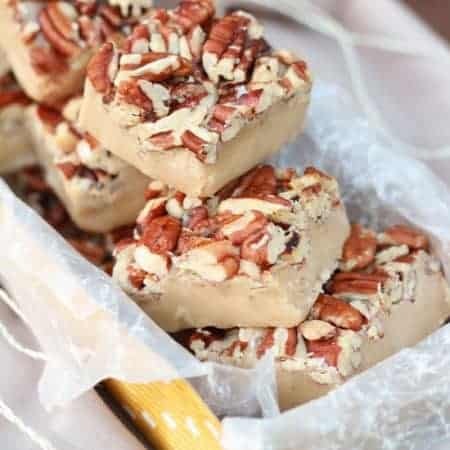 This recipe will always hold a special place in my heart. I first made these cupcakes three years ago when we welcomed our daughter into the world. We celebrated the arrival of our sweet Juliette with these pretty pink Strawberry Cupcakes, and I’ve made them every summer since. These cupcakes made an appearance at her first and second birthday parties, and soon they’ll be part of her third birthday celebration. They make a great celebration cupcake, as well as a great everyday cupcake (that means you need no reason at all to make them). Fresh strawberry flavor, swirly pink frosting. These have it all! Enjoy! 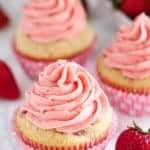 Moist and tender vanilla cupcakes filled with fresh strawberries and topped with strawberry buttercream. Preheat oven to 350°F. Butter a 12 cup muffin tin or line with paper liners and set aside. In a medium bowl, whisk flour, baking powder and salt, set aside. In a stand mixer with the paddle attachment, beat butter on medium-high speed for 2-3 minutes, until light and fluffy. Scraping the bowl as needed. Gradually add the sugar and beat until well combined. Reduce the mixer to low and add the egg, egg whites, and vanilla extract. With the mixer on low, add half the flour mixture, mixing until just combined. Add the milk, mixing until just combined. Add the remaining flour and mix until just combined, scraping the sides of the bowl as necessary. Using a rubber spatula, carefully fold in the chopped strawberries. Divide the batter evenly among the prepared muffin cups. Bake for 18-20 minutes, until a toothpick inserted into the center of the cupcakes comes out clean. Transfer the muffin tin to a wire rack to cool completely before icing. In a small food processor, blend about 1/2 cup freeze dried strawberries until they turn into powder. Pour the powder into a fine mesh sieve, discarding the solids and seeds, keeping the fine powder that came through the sieve. Measure out two tablespoons of the powder to use in the frosting. Proceed below. 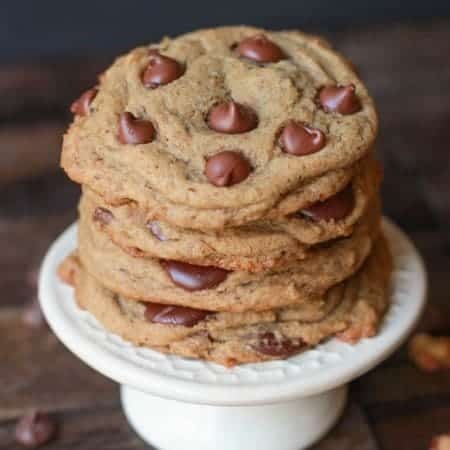 With a hand mixer, or stand mixer fitted with the paddle attachment, beat butter for 2 minutes, until smooth and creamy, scraping down the sides of the bowl and the beater as necessary. Add the powdered sugar, 1/2 a cup at a time, beating until combined. Add strawberry puree, freeze dried strawberry powder (if using), vanilla extract and jam, and beat on medium speed until fully combined, being sure to scrape down the sides of the bowl and beater as needed. If necessary, adjust the consistency by adding more powdered sugar or more strawberry puree, to thicken or thin it out. Place in a piping bag, or use an offset spatula to frost cupcakes (this makes enough frosting to generously frost the cupcakes). Garnish with sliced strawberries, if desired. 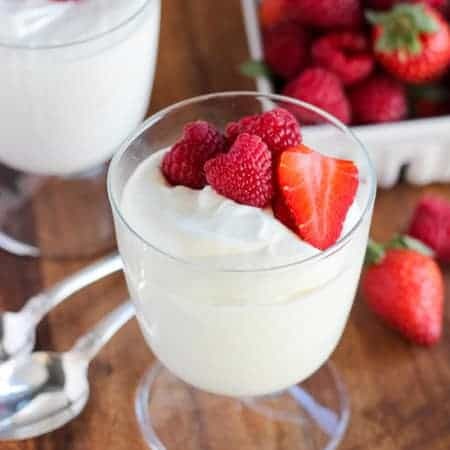 To make fresh strawberry puree: place 5-7 chopped strawberries in a small food processor and blend until pureed. TIP: If you are also using freeze dried strawberries, blend those in the food processor first, then remove them and add the fresh strawberries. Freeze dried strawberries: Adding freeze dried strawberries adds a deeper strawberry flavor and a darker pink color. I especially recommend using these if you are using fresh strawberries that are not super sweet, ripe and flavorful. I store these cupcakes in the refrigerator. It helps the frosting from getting too soft. I like to allow them to come to room temp before serving. Just wondering if you had a weight measurement the 12 tablespoons of butter? Can’t wait to try these when strawberries are more in season in Australia. Hi! I believe it is 6 ounces. Enjoy! Hi Bec! My scale measured 4oz if that helps! On stick butter there are usually markings per Tablespoons. Why use strawberry jam in frosting. It would be quite sweet. It adds a concentrated strawberry flavor. I only use a little to keep it from getting too sweet. I made these and the frosting cuddles and was far too sweet, not sure what I did wrong! The frosting curdled? If so, the butter was likely too soft. Also, if the butter was too soft you would have had to keep adding powdered sugar to thicken it, and that would have contributed to the frosting being too sweet. Hi, your recipe turned out so well! I loves it, and I will make it again. The frosting and cake was perfect. Can I use the same recipe to make a normal round cake? I haven’t tried it, but you should be able to split the batter between two 8-inch round cake pans. Begin checking them around 12 minutes. I followed the recipe exactly and the cupcakes came out like bricks. The recipe didn’t say to beat the egg whites, but maybe that is what needed to be done. 1) Accidentally over-measuring or over-beating the flour. 2) Forgetting some of the wet ingredients. Did you use WHOLE milk? 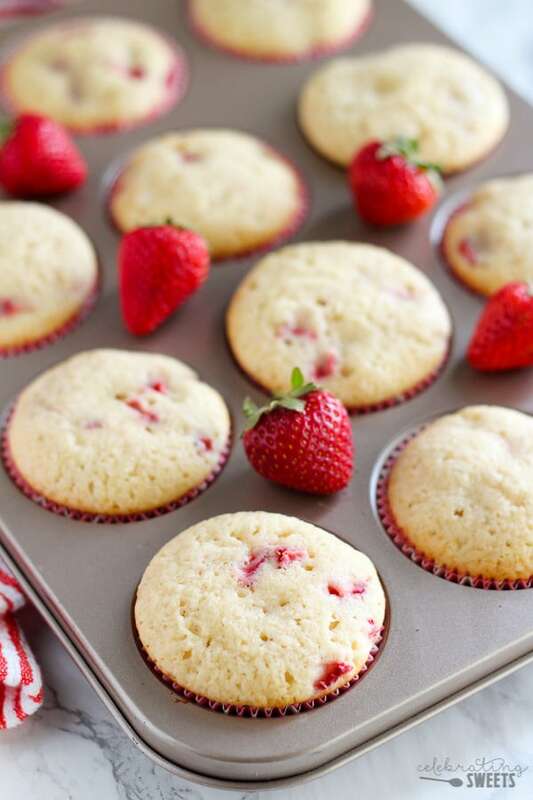 3) Using under-ripe berries (or even frozen berries) can result in a less appealing cupcake. Since the berries are the star of this cupcake, using berries that aren’t ripe, sweet and juicy can make for a cupcake that lacks flavor. That will be fine. Enjoy! Hey Allison, such a delicious post. Strawberries are my kids favourite fruit. I will try this at my home. Thanks and keep sharing!